A third-person perspective action game developed by Rockstar Games, a company known for Grand Theft Auto and Midnight Club series. Red Dead Revolver was developed by Rockstar San Diego, a studio previously known as Angel Studios. The title was at first developed by Capcom, but Rockstar Games took over the team and the rights to the franchise. This led to a change of convention from weird western to spaghetti western. The cinematic genre was not only an inspiration for the developers – it also served as a source of music; certain tracks by Ennio Morricone, which originally appeared in movies, were used in the game. The story of Red Dead Revolver for PS2 and XBX starts in 1880 in the Wild West. Nate Harlow and his partner Griff had found a gold deposit in a place called Bear Mountain. The news about the finding quickly spread across the neighboring area and general Diego himself (a former soldier of Mexican army who leads a group of local thugs) became interested in such an easy fortune. The villains managed to capture Griff, who in exchange for sparing his life promised half of the gold he found. Diego accepted the proposition and sent Daren, his right hand, to the place. Nate, who wanted to protect his property, was killed by him. Nate’s son and main protagonist of the game, Red, saw all that. The protagonist swore vengeance and his father’s revolver is to help him in achieving the task. As the game progresses, the story becomes complicated and player learns about new plot twists from well directed cutscenes. It is worth adding that despite the serious atmosphere, there is some occasional humor as well. 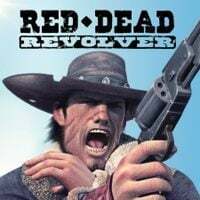 Red Dead Revolver for PS2 and XBX is an effective shooter in which the action is shown from third-person perspective. The game is linear and the levels are placed in places typical for classic westerns, like small towns, saloons, farms and canyons. Red Dead Revolver also features a classic level inside a train. The gameplay focuses on elimination of enemies – the protagonist can not only shoot, but use surrounding objects and hide behind cover as well. He has access to around thirty different weapons, including the titular revolver and various shotguns, machine guns and explosives. New weapons can be bought for dollars obtained during the missions. The Deadeye mode is an additional attraction – after filling a bar visible on the screen, the player can slow down time and aim more accurately or plan his actions better. From time to time he will also face bandits in iconic one on one duel at noon. In this case the time slows down as well and the player is tasked with drawing the weapon and shooting accurately at the right moment. As the game progresses, the difficulty of these duels increases and they require better reflexes. Red Dead Revolver for PS2 and XBX looks good. The player can enjoy character models filled with details and surroundings that are rich with side activities. The high quality graphics are reinforced by an atmospheric soundtrack, extracted from cult westerns.